Auto Lift CR14 EL Extended Derek Weaver Co., Inc.
Forward® Lift CR14 EL Extended four post lift. Accommodates up to 206.5" maximum wheelbase. Local Sales Tax May Apply when shipping from Manufacturer. Picture shows alignment kit and air jacks not included in price. Forward® Lift’s CR14 EL Extended series of commercial automotive lifts has obtained ALI certification, the Gold Standard of the automotive lift industry. With 14,000-lbs. 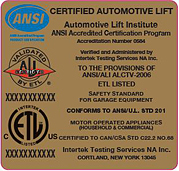 of capacity and the capability to handle up to 206.5" of Wheelbase this car lift is perfect for any car dealership or independent repair shop servicing and maintaining a full range of vehicles including heavy duty pickup trucks. The CR14 EL Extended series utilizes advanced cable design and air operated single point lock release locking mechanism. The locking mechanism incorporates internal lock ladders in each column that allow for easy leveling of car lift. The CR14-X Extended series locking mechanism also has a secondary locking mechanism that automatically engages in the event of a slack cable. For wheels free service the Forward® Lift RRJ-70G roller jack can be added to the CR14 EL Extended series four post lift. The addition of the Rolling Jack allows additional revenue generating service such as brakes and other wheel service. All CR14 EL series four post lifts include anchor bolts, installation manual and is powder coated for a durable finish. The Forward® Lift CR14 EL series is backed by a 5 Year Structural Parts Warranty, an 18 Month non-structural parts warranty - power units, cylinders, cables, arms, etc. and a 6 Month Labor Warranty. An optional eighteen month Extended parts warranty may also be available. The Forward® Lift CR14 EL is proudly manufactured by Dover Corp.'s Vehicle Service Group (VSG). VSG comprises nine major vehicle lifting and collision repair brands: Rotary Lift, Chief® Automotive Technologies, Forward® Lift, Direct-Lift®, Hanmecson®, Revolution® Lift, Elektron, Blitz® and nogra®. Based in Madison, Ind., VSG has operations worldwide, including ISO 9001-certified manufacturing centers in the U.S., Europe and Asia.